Montana is a state of two halves. The eastern (much larger) part of the state is dominated by the vast rolling landscapes of the great plains, more similar to the Dakotas or Kansas than to any of the states to the west. The western part is dominated by massive mountain chains, including the mighty Rockies. As much as I like the open sky of the great plains during our visit we were largely confined to the mountainous west of the state. We entered Montana driving the I-90 from Spokane. Here this major freeway at times resembles more of a roller-coaster than the major road artery it is. There are none of the long tunnels or sweeping bridges of the Alpine roads in Europe, just lots and lots of tight curves. That makes driving it quite fun. But it is still a multi-lane motorway so we left it as soon as it was feasible and took some really minor local roads (in places controlled by the Confederated Salish and Kootenai Tribes of the Flathead Nation) and headed north towards the Flathead Lake. On our way we encountered the unique landscape of Camas Prairie. This distinct geographical region is a treeless and open area in an otherwise heavily forested and mountainous region. Its name comes from the Camassia plant which was once widely used by the Native Americans and the first white settlers as a food source. But now it is a place dominated by ranching. The landscape is somehow similar to the Great Plains with the exception of mountains visible in all directions and it all looks spectacular, especially in the late afternoon when the sun is getting lower. Late in the day is also the best time to examine the giant ripple marks visible from the Montana Hwy 382. These marks are essentially the same forms as the ripple marks you can see on a sandy bottom of a typical stream, or on a beach. The difference is the size as rather then mere inches here they measure 25 to 50 feet (7.6 to 15.2 m) high and 300 feet (91m) long. These rare geomorphological features were created during periodic cataclysmic floods in the last ice age, the same floods which carved the Grand Coulee in Washington state. From the Camas Prairie Valley we headed towards the Rocky Mountains, passing along the picturesque Flathead Lake shore as well as through the suburban sprawling mess of Kalispell, which is the largest town in this part of the state. Then we finally stopped for the night in a small town right at the foothills of the Rockies. At the first motel we checked we were slightly put off by a skeleton, albeit plastic, hanging on the front porch. Sure, Halloween was just around the corner but the proprietor just didn’t fill us with confidence either. The following day we started early as we really wanted to explore the Glacier National Park. Upon arrival at the gates of the park we learned that admission was free as it was National Public Lands Day. It was second time it happened to us, a couple of years ago we got in for free to the Grand Canyon National Park, both times it was an absolutely unplanned bonus saving. Our first stop inside the park was a loo stop in the beautiful Lake McDonald Lodge which, as the names suggests, is located on the banks of the namesake lake. 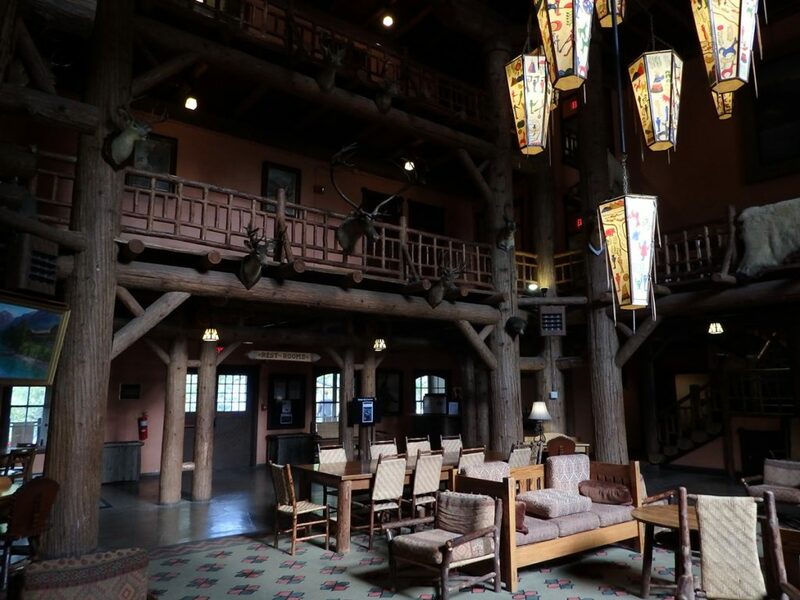 It is a great example of the grand hotels built in a rustic resort style by the railway companies at the beginning of the 20th century to promote tourism in the American West. 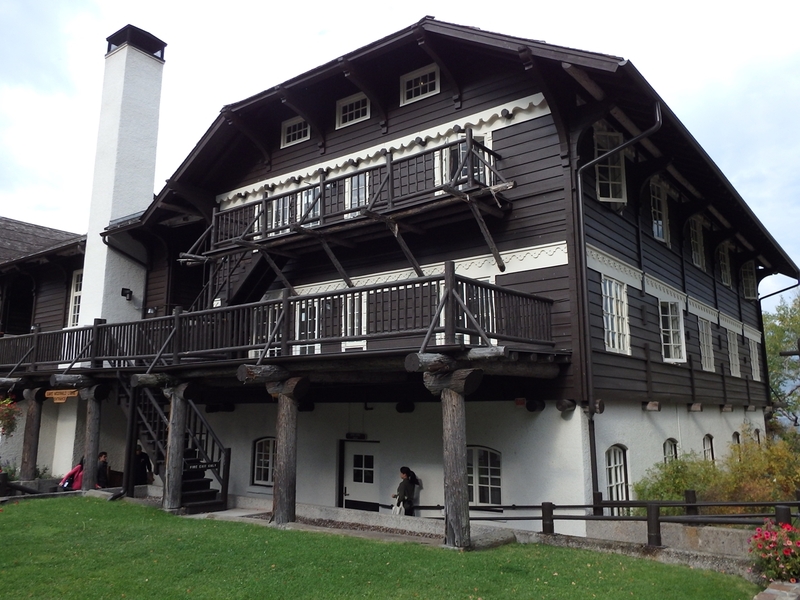 It might be not as grand as the Old Faithful Inn in Yellowstone but it is still an impressive building with its heavy timber frame (made of crudely finished logs), three-storey high lobby (where the timber frame is purposely exposed) and large stone fireplaces. It opened in 1914 and guests initially arrived there by boat. That explains why its current main entrance (from the parking lots) is somehow subdued in comparison as the road only reached it in 1921. The interior decoration, with skins and taxidermy mounts of native species might not be to everyone’s taste but overall the building is quite fun place for a short stop. The best way to see the dramatic scenery of the park (without hiking for days) is to drive the spectacular, and aptly named Going-to-the-Sun Road. This is an absolute engineering marvel, a 50 miles long road, climbing all the way to the elevation of 6,646 feet (2,026 m) at Logan Pass where it crosses the Continental Divide. The road is narrow and winding, with tight hairpin turns, resembling narrow mountain roads in Italy or Spain more than anything in the US. However, built between 1921 and 1932 it is one of the first National Park Service projects specifically intended to accommodate the automobile-borne tourists which is as American an idea as it gets. 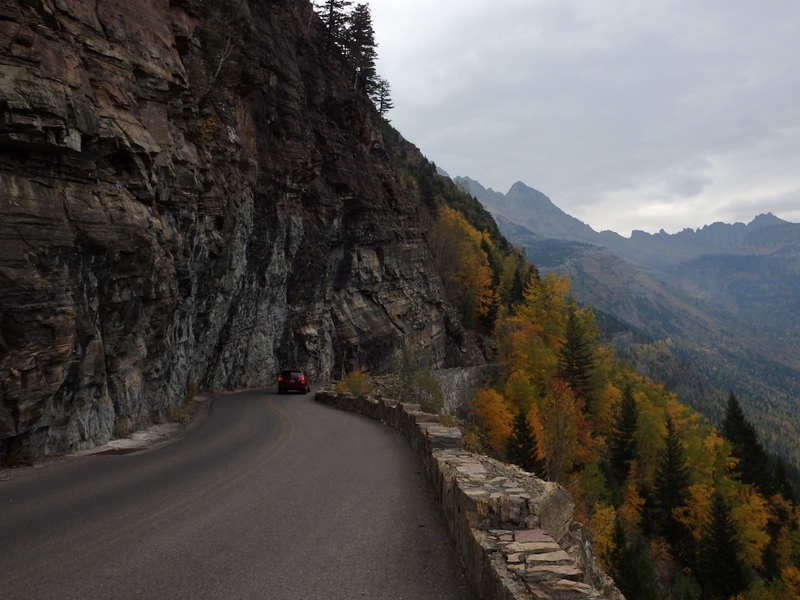 We drove slowly uphill, stopping multiple times to admire the views and to take photos until we finally reached the top of Logan Pass. Here we decided to stretch our legs. First we chose to take the Highline Trail. It is about 18 miles long so we decided to follow it a bit and then backtrack. 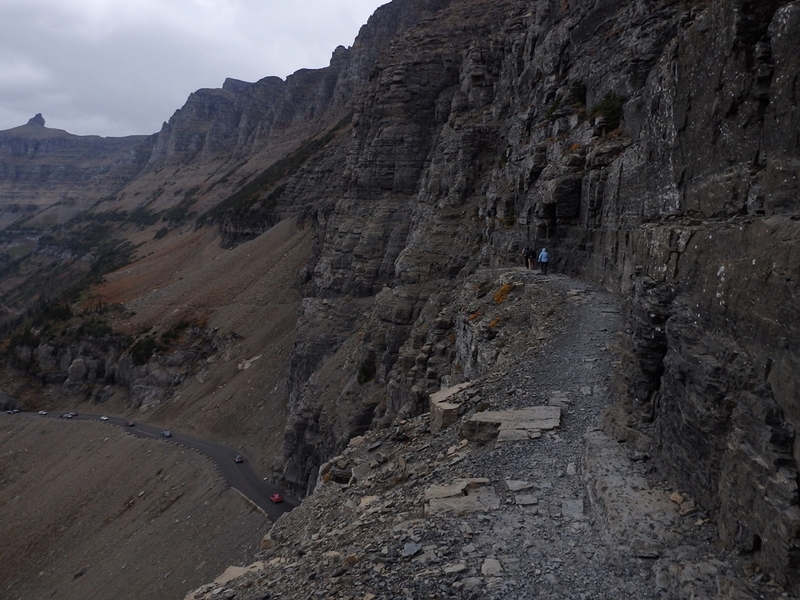 Luckily the most spectacular section stretches right from the Logan Pass. Here the trail follows a narrow ledge along the so called Garden Wall area, one of the most scenic areas in any national park in the US. In most places the ledge, hanging like a shelf, is only three to six feet wide, and has drop-offs of roughly a hundred feet or so down to the Going-to-the-Sun Road below. It is not a place for those who are scared of heights but it offers amazing vistas with no climbing involved as the trail is almost level. A perfect combination if you ask me; beautiful wild scenery and a bit of thrill but no sweat (unlike for example the also spectacular but extremely tiring Angel’s Landing trail in Zion NP). We walked for a while until we got stuck behind a group of hikers who got stuck behind a pair of mountain goats. 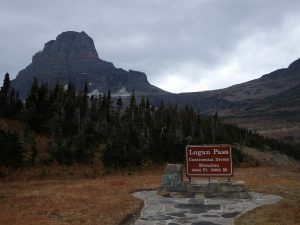 As we passed the most spectacular part of the trail, rather than continuing slowly along we decided to head back to the main visitor centre at Logan Pass and try another trail from there. This time we chose the Hidden Lake Trail which, as the name suggests, leads to a lake. It slowly climbs via a series of boardwalks (to protect the fragile plants on the meadows) for 1.5 miles until it reaches an overlook offering a fine view of the lake and the surrounding amazing alpine scenery. The lake itself is a further 1.5 miles away but as the weather was threatening rain we decided to go back from the overlook. Once we reached our car and were on our way out of the parking lot we got caught in one of the “bear jams”. As there was a bear, just a few hundred feet from the road, everyone was slowing down to see it and snap some shots. Of course we did the same. Luckily a park ranger was organizing the traffic to avoid a total standstill. It was a perfect end to our time in the highest part of the park. We saw a bear but from the safety of our car rather than on a trail (there were warnings about bear activity along the Highline Trail). From Logan Pass the road heads east, dropping in elevation relentlessly until it reaches the end of the Rockies and the beginning of the prairies. It is amazing how sudden the change is. 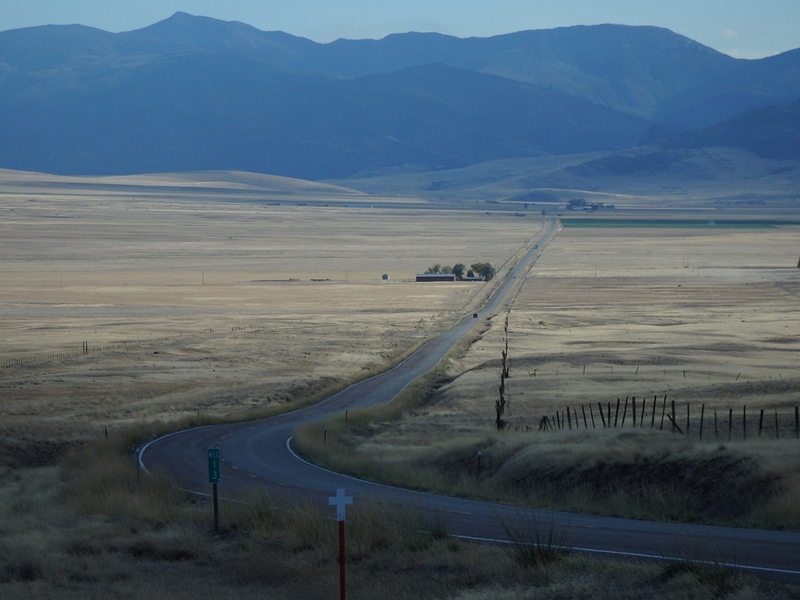 In well under an hour we had left the alpine scenery and threatening moody weather and entered the sunny countryside of eastern Montana, with its vast blue sky and open landscape (a landscape that stretches across several states as far as the Great Lakes, 1500 miles away). The eastern side of the Rockies is much drier and more sunny than their western slopes and it was clearly visible. Pure geography in action. 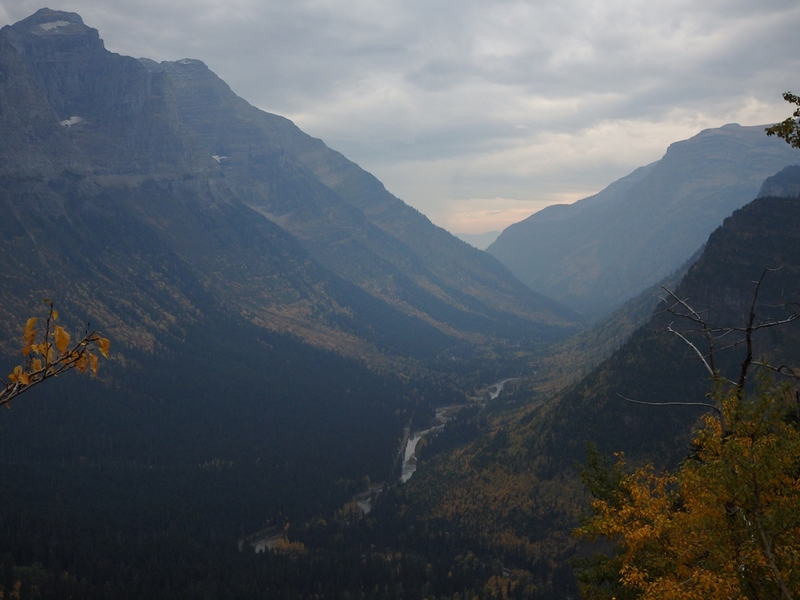 Overall the Glacier National Park is one of the most spectacular parks I have ever visited. 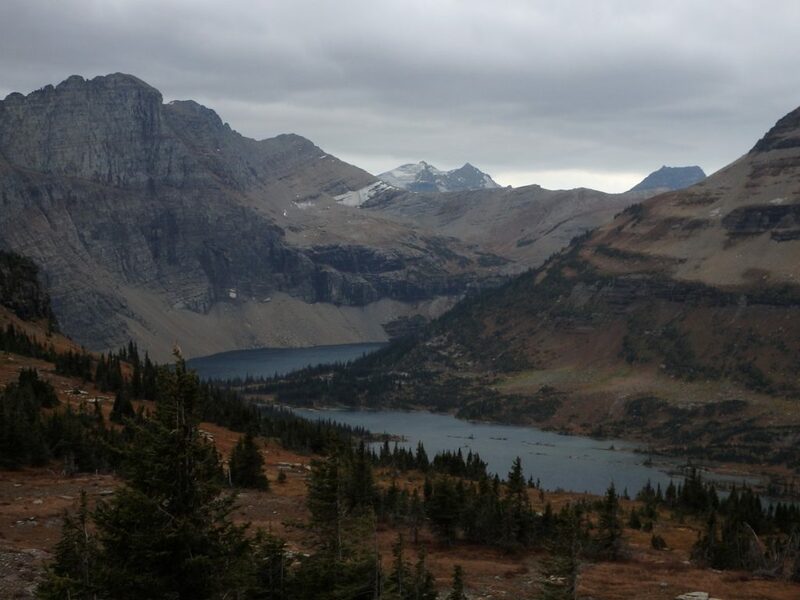 The weather was a bit gloomy and moody, not unlike during our exploration of the Canadian Rockies a few days before, but it actually enhanced the majesty of the mountains. No, we don’t have the postcard-perfect sunny shots but on the other hand the lighting and shadows were constantly changing with every passing cloud, making things more interesting. Also, the dark skies and snow on the mountaintops were a constant reminder that we were in a wild territory. Now we only had a short drive north to enter the last region on our itinerary, the Canadian province of Alberta. We crossed the border at one of the small local crossings. No queues, no waiting, just a quick stop and we were back in Canada. More about it next time. 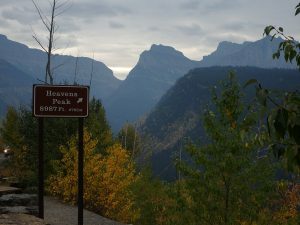 This entry was posted in Uncategorized and tagged Camas Prairie, Glacier National Park, Going-to-the-Sun road, Hidden Lake Trail, Highline Trail, Logan Pass, McDonald Lodge, Montana on June 4, 2016 by admin. Nicely done. I agree with you about clouds offering more interesting lighting than cloudless skies. I’m spending 4 days in/around Glacier in a month, so your article just whetted my appetite a bit.